“MAY QUEEN and the SIXAREEN - ARCHAEOLOGY of JOURNEYING” is an exhibition of watercolours by Jack Chesterman. Jack is related to the Tasmanian Chesterman’s, but hails from the UK. 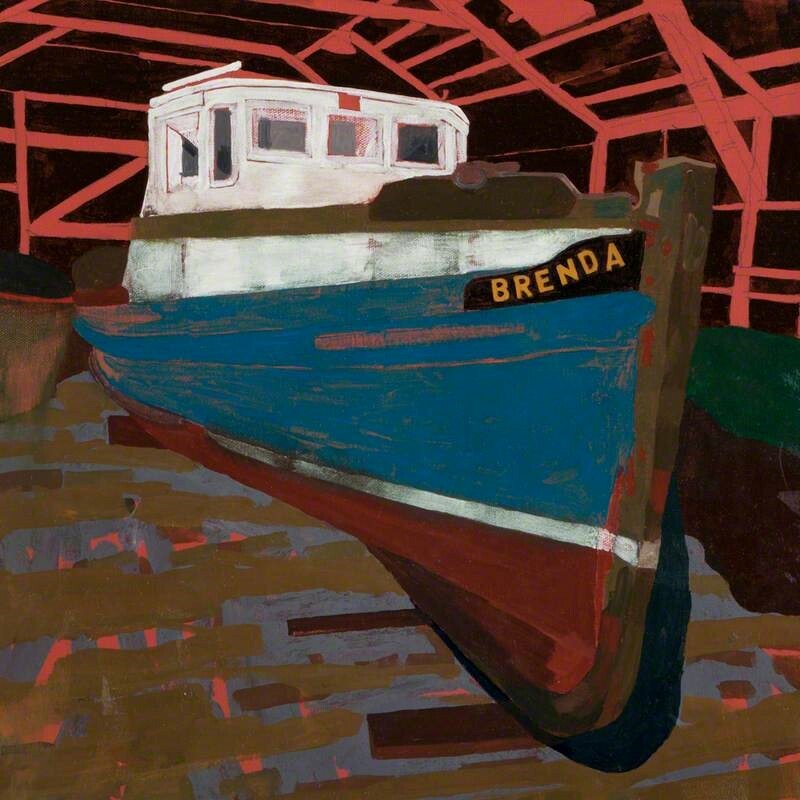 This exhibition explores two iconic boats, a favourite Tasmanian vessel, May Queen, and the sixareen, a traditional clinker-built fishing boat used around the Shetland Islands, north of Scotland. The first sixareens were imported from Norway in kit form until the mid-19th century, when it became more cost effective to build the boats in Shetland. For many years, Jack visited the Shetland Islands annually. The May Queen and the sixareen are iconic by virtue of their specific histories and place in maritime history. In broader generic terms, as wooden boats operating over a century ago, they have played an important role in the founding and development of coastal communities. Their influence was manifest in areas of transport, commerce, the spread of ideas and much else. 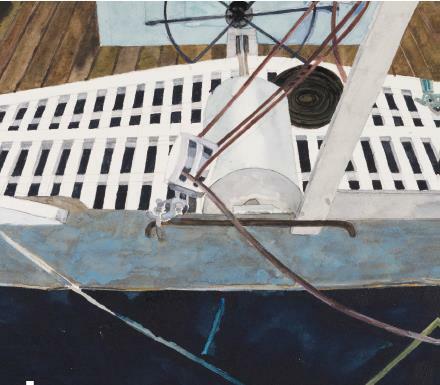 Current themes in Jack's work may be characterised as maritime or landscape and these provide a context for subject matter and narratives related to journeying, history and loss. These two boats two boats, while of considerable interest in themselves, are for a number of reasons paired in this current work. Firsly jack has a personal and first hand knowledge of them both and has previously drawn and painted them. For aesthetic reasons as powerful visual objects they complement each other and despite or maybe because of the dramatic disparity of their locations, a sense of universality may be drawn from the theme. Billowing sails and white horses are for another exhibition and another time. 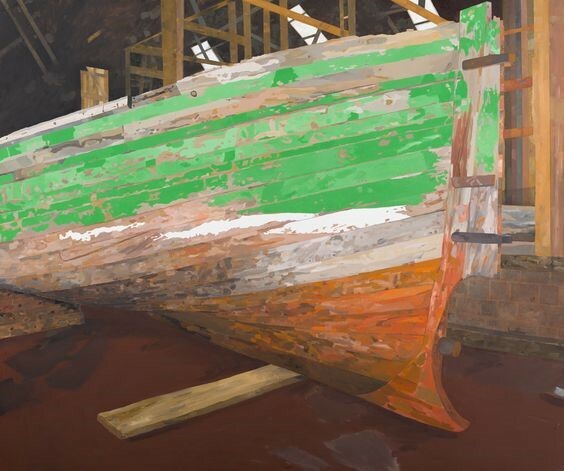 If there is a narrative here it concerns the physicality of the boats; how wood fits to wood, how surfaces relate one to another and how configurations of form are born from the requirements of work. Although the images relate to the practicalities of form and function they don't spring from the shipwright's paln and are more to do with poetry then journalism. Jack Chesterman was born in Lahore, India. As a child, he lived in Australia prior to settling in England. He served briefly in the Household Cavalry and worked as farm labourer, before eventually pursuing his artistic interests as a mature student at both Leeds College of Art and the Royal College of Art in London. He has had a longstanding painting and printmaking practice and has exhibited widely in the UK and abroad. His work is held in a number of private and public collections. He has a longstanding interest in journeying, has researched maritime history and explored the culture of many seafaring communities from the Shetland Islands to Whitby, and made work inspired by these experiences for many years. He has also followed a career in Art and Design Education, working in a number of universities as both a lecturer and education manager. He taught at Leeds College of Art for 30 years. The exhibition runs until 22 April 2018.